Anyway, Trent can spend as much as he wants on food. My point is that a frugality expert should spend much less than average – especially when he recommends coupons, gardening, and making homemade things (diapers, bread, etc) to keep costs down. I disagree with her entire argument, actually, because I don’t agree that spending the minimum at all times is frugality – it’s cheapness. Frugality is about getting the maximum value for your dollar while living squarely within your means, and I find that a loaf of homemade bread gives me much more value for the dollar than a loaf of bread from the store, for one example. But what disturbed me most of all was the use of the phrase “frugality expert” in relation to me. On this site, I write about the mistakes and choices I make all the time. I don’t communicate perfectly with others, including my wife. I sometimes spend more than I should and get tempted to buy more books than I need. I choose to buy more expensive products sometimes, such as free range chickens and organic milk, which raises my food bill. I change my mind about long term plans more often than I could. I’ve often been afraid of trying new things with my money and sometimes get locked down in analysis paralysis. And that doesn’t even touch on the absurd number of money mistakes I made in my teen, college, and early adult years. Whenever I do mess up, I spend some time thinking about it. What can I learn from that mistake? How can I share that mistake with others so that they learn something from it, too? At the same time, I read a lot about personal finance and I try a lot of different things. I make my own laundry detergent. I bake bread. I try cost-comparisons between fast food and home cooking. And I write about all of it. I write about the facts I find in books, the things I try myself, the things I succeed at, and the things I fail at. I write about the occasional great idea I have, and I also share the very niche-oriented ideas I sometimes have that don’t really apply to many people. I talk about what I think and feel and I try very hard to encourage others to take what I’ve figured out and go beyond it. None of this makes me an expert. Because I’m not one. It would be very easy for me to claim that I was a frugality or personal finance expert. I’d simply stop writing about the real situations in my life and start writing lists of tips. I’d never talk about my mistakes, only my successes. And I’d be presenting a front to you guys that isn’t the truth of how I live my own life or how you live yours. 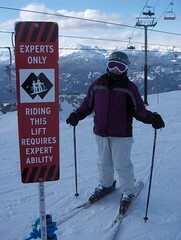 If that’s the kind of “expert” you want, go elsewhere. You’re not going to find that kind of “expertise” here. That’s not to say I don’t find a lot to learn in a well-researched list of frugality tips, but that doesn’t imply to me that the person is a “frugality expert.” It just means the person has discovered useful tips worth sharing. I can’t see how they live – all I can see is the result of some research and creative thought, and that could come from a billionaire just as easy as it could come from a minimum wage worker. What’s my actual definition of a frugality expert? The biggest one that pops into my mind is my parents. I’ve watched them stretch a paycheck far and wide since I was a baby, using countless little creative ideas to keep a roof over our heads and to make some wonderful childhood memories for me. I’ve watched them make very hard choices, and I’ve watched them make meals out of whatever food they could find. My father taught me how to grow my own food and catch even more. My mother taught me how to sew on a button and hem a pair of jeans. But if I were to call either one of them a frugality “expert,” they’d laugh at me. They’d point to the mistakes they’ve made in life and the times when they spent money they shouldn’t have. In other words, the experts on frugality are the people that practice it as often as they can. They’re the people shopping at Fareway and Aldi. They’re the people going through clothes at the Goodwill Store. They’re the people who drive a truck more than ten years old but have a strong-paying job. They’re the people that you’ll see at the free community concerts each week. Frankly, they’re the people down the block from you. But they’re not perfect, either – they’re just seeking a life of financial stability and happiness. If you want someone to simply list the solutions for you every day, The Simple Dollar isn’t the place for you. But if you want someone who actually is living through this stuff, figuring out their money, dealing with the issues that money interjects into life, and trying to figure out how to be a better person along the way, then you’re at the right place. But please don’t call me a frugality expert. Or at least hold off for thirty years or so, until I’ve accumulated as much wisdom as my parents.